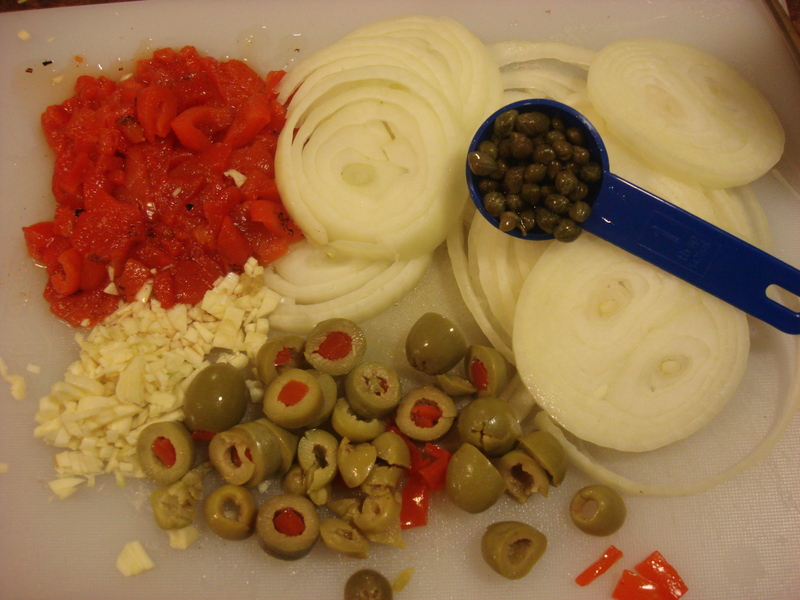 The makings of yuca salad…you may never make potato salad again! This version – with more roasted red pepper — is more colorful! Play around with the proportions! I’ve got nothing against potato salad; in fact, it is a big favorite of mine for summer barbecues, church functions, Christmas buffets or midnight raids on the leftovers. But Game Day calls for a more assertive strategy: yuca en escabeche (or, as my friends and family know and love it: yuca salad) is the clear winner for full flavor, honking big texture, great colors and the ability to stand up to spicy wings and ribs. It has the heft to defend against the beer and alcohol blitz of Super Bowl Sunday, but is not so exotic looking or smelling as to scare off cautious diners. And of course it makes for more interesting conversation amongst those who are only really there for the food and the commercials. Yuca (Manihot esculenta) is a rough-skinned root vegetable native to Brazil. It is also known as cassava, manioc and mandioca. The bitter kind has a poison that native Americans from the Caribbean on down used to tip their hunting arrows with back in the day. We’re not serving that kind. In fact, I have never seen it (although that is exactly the type that gets made into bland tapioca – go figure). Up here we get the sweet kind that simply needs to be peeled and boiled to share its goodness (just don’t eat it raw). I must confess I don’t even peel it myself usually. I buy it pre-peeled and tidily frozen in 1.5 lbs portions for $1.99. Then I can use it when I want (and believe me, peeling tropical tubers is enough of a pain that your purchases can go bad waiting for you to get motivated to do it). Before you dismiss the whole idea because you think your suburban supermarket chain won’t have it, please check the frozen food section/ask at customer service. I get my frozen yuca at Waldbaums here in suburban Long Island in a neighborhood not known for its Caribbean/South/Central American/or Indonesian population. So, before I impart this recipe to you, let me say that it is my most-requested (This one is for you Jayne, Ashley and Vanessa). It is the one that I counted on to feed the hordes at my legendary barbecue birthday parties in Puerto Rico for 70+ hard-partying people. It is the one I bang together for any buffet, pot luck, or spontaneous dinner party for 14. 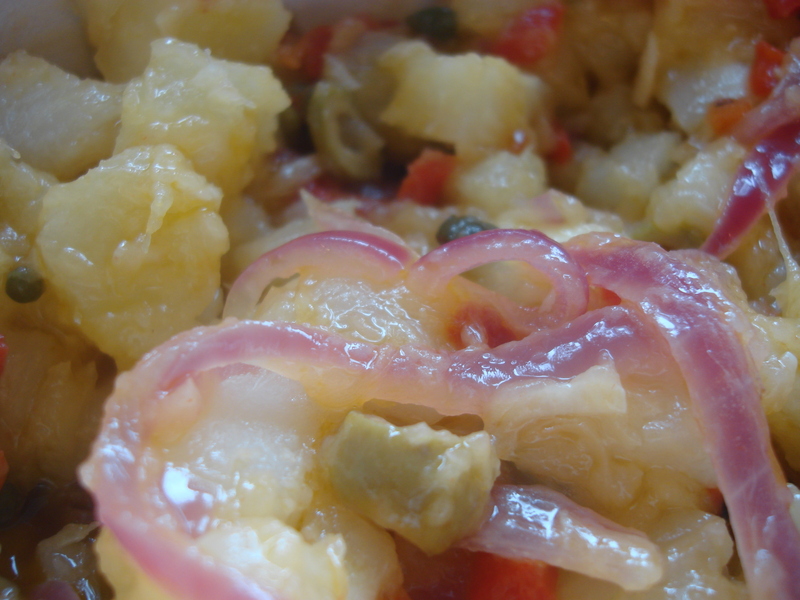 It does not discriminate; yuca salad goes with chicken, meat, fish – pretty much anything you introduce it to. It requires little work, but works hard for you and makes you look very clever. I encourage you to give it a try this weekend for Super Bowl, ’cause it’s gonna make you look good. While the yuca cooks, heat the oil in a sauce pan until very liquid. Add onions and cook at medium high until wilted and becoming translucent. 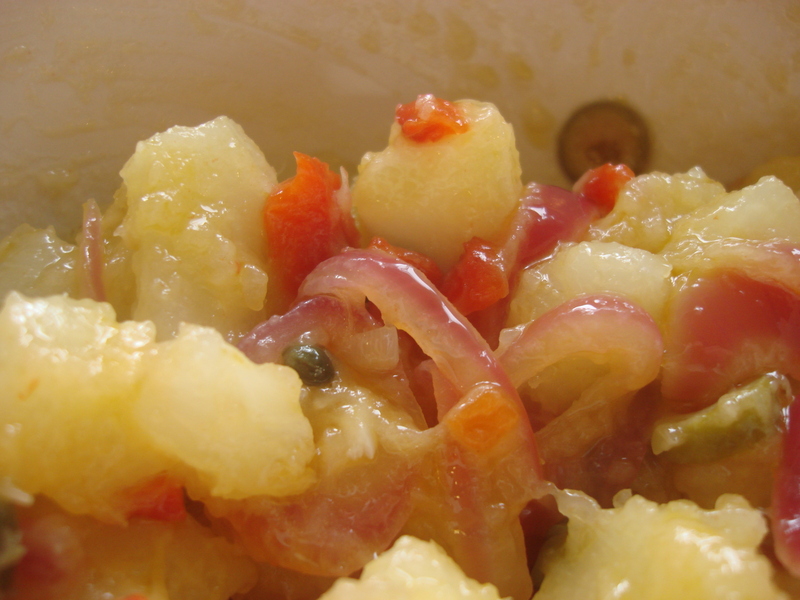 Add remaining ingredients and simmer for five to ten minutes while you attend to the yuca. The yuca will have a thick inner fibrous thread which must be removed (it will practically fall out by itself). 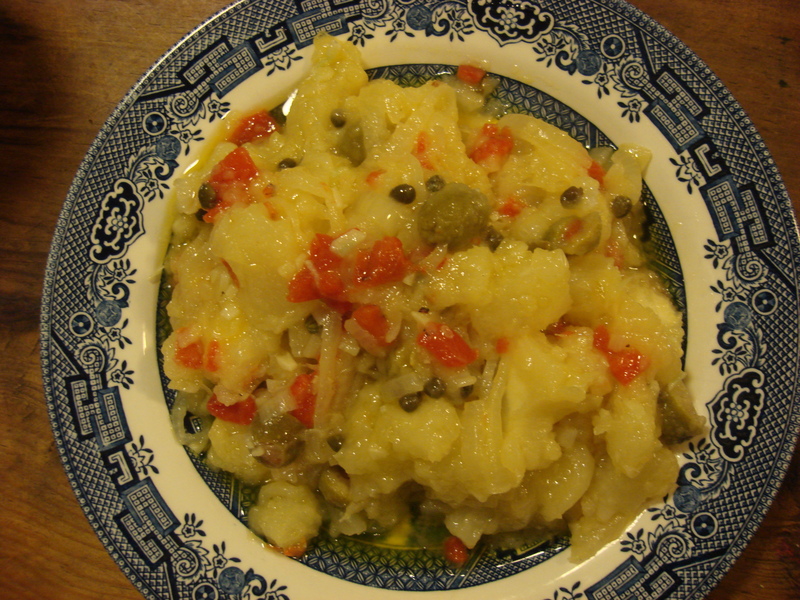 Then slice the yuca into 1” by ½” slices (just like potatoes for potato salad) into a bowl. You will notice its density and starchiness! 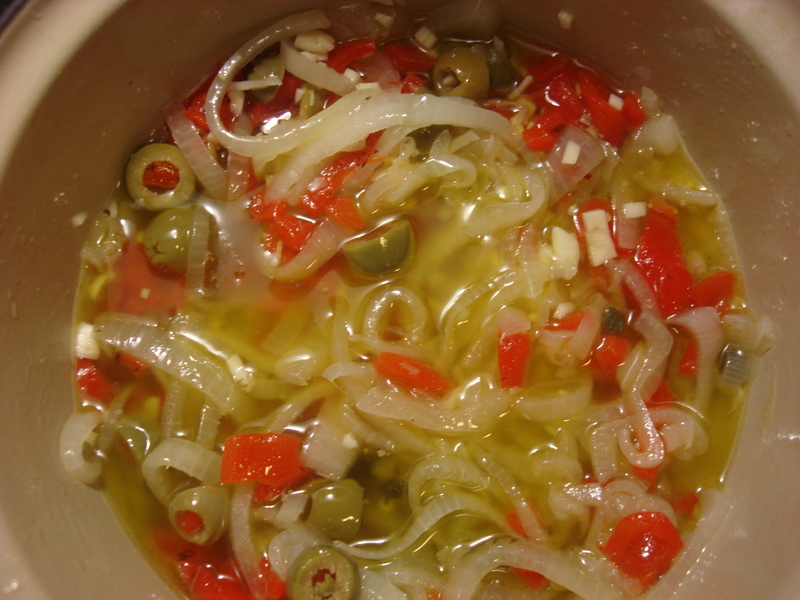 Add vinaigrette, mix well and serve. It can be kept in the fridge a few days, but must be brought to room temperature before serving. And what a great alternative this is! 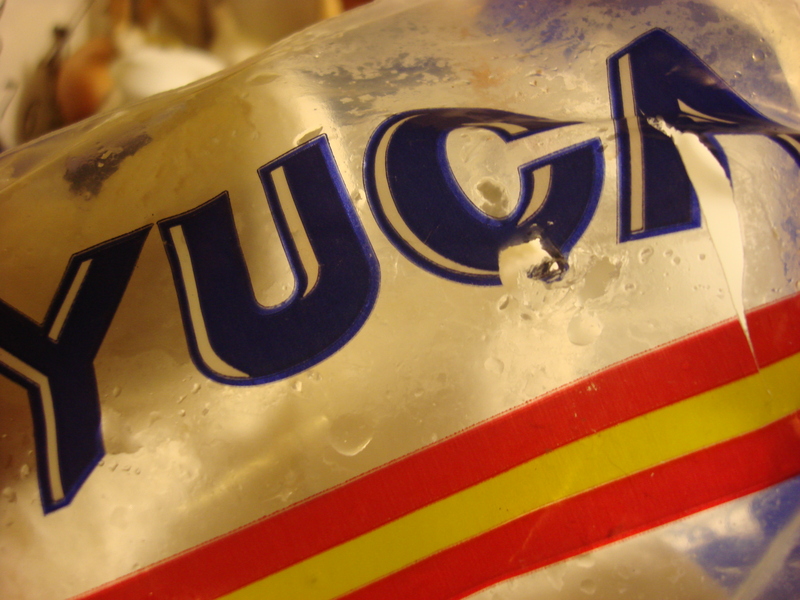 we love it over here…and I am spreading the gospel of yuca to all who will listen! Note to readers: I am reblogging this, one of the top HC&E posts ever, because it is one of our family favorites AND the best potato salad alternative for Game Day! This sounds delicious! One of the best parts is that I have almost all of those ingredients at home already. Can’t wait to cook it – thanks for sharing!